It’s all about protecting the ones you love most…. Can you imagine what might happen if your child, grandchild, or pet plays in a yard that is contaminated by seepage from a faulty septic system? The results can be disastrous! Untreated human waste is a primary source of E-Coli - bacteria so deadly that it can cause serious illness or even take the lives of those you love. 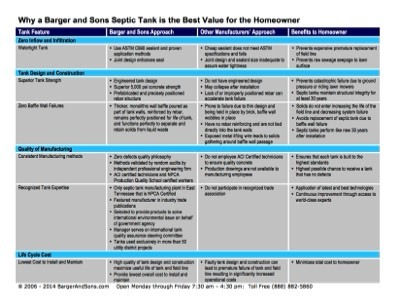 You can help ensure a safe environment around your home by insisting on installation of a Barger and Sons watertight septic tank, the highest quality residential septic tank available to homeowners in the East Tennessee area. The quality and structural integrity of a Barger and Sons tank result in the highest possible level of performance and keep raw sewage where it belongs – below ground and away from your loved ones. â—� Based on a comprehensive review by an independent professional engineering firm, our tank manufacturing operations have been certified to meet the high quality standards of the National Precast Concrete Association – Barger and Sons is the only East Tennessee tank manufacturer to achieve this certification. â—� We use stronger concrete than most manufacturers – concrete rated to withstand 5,000 pounds force per square inch, which far exceeds minimum requirements. We reinforce this concrete with steel bars that are fabricated into a carefully spaced cage that provides the highest possible structural integrity. This means you don’t have to worry about a Barger and Sons tank collapsing under normal load. Did you know that improperly spaced rebar installed by many other tank manufacturers can actually accelerate failure of the tank? â—� Every septic tank has an internal baffle that keeps solid waste from reaching the field line and causing failure of the system. While other manufacturers use a baffle that simply slides into a groove in the tank walls and is prone to failure, our baffle is poured as part of the wall structure and does not fail! â—� Our tanks are built with precise dimensions, meaning all pipe connections line up properly and seals work as designed to eliminate leakage.